MADISON – Wisconsin is a top target for liberal groups across the country, and resources are pouring in to help Democrats win in November. There are two main national leaders in this effort: Former U.S. Attorney General Eric Holder and California billionaire Tom Steyer. Whoever wins the gubernatorial and state senate races will be in office during redistricting in 2020. Democrats want to be in charge of that process so they can gerrymander the maps to help them take control of congress and the state legislature. Wisconsin is one of 12 states the left has in their sights. Holder was in Milwaukee on Sept. 18 to endorse Democrats Tony Evers for governor and Mandela Barnes for lieutenant governor. “These are men who will focus on those people – the average citizens here in Wisconsin. Not the special interests – not the folks who come from out of state and pour huge amounts of money into campaign coffers,” said Holder, who does not live in Wisconsin. 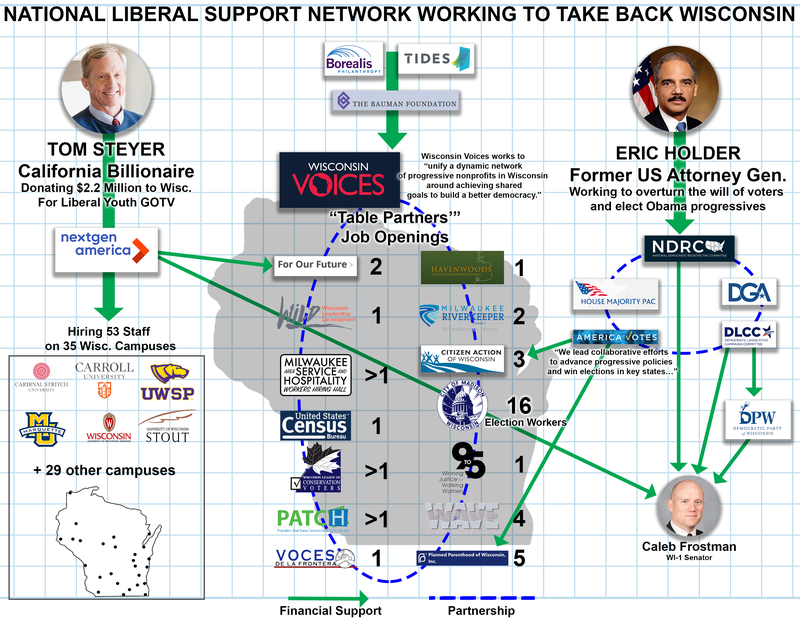 There is a great deal of out-of-state money from special interest groups supporting the Evers-Barnes campaign – including from groups affiliated with Holder himself. One of his non-Wisconsin partner groups, “America Votes,” financially supports Planned Parenthood of Wisconsin, which has spent $370,000 on midterms so far. Another partner, the Democratic Governors Association, has provided $25,000 to Evers’ campaign. There are other Washington D.C. players on the field in Wisconsin, too. AFSCME, as of Oct. 5, has spent $210,000 in independent expenditures supporting Evers and attacking Republican Gov. Scott Walker. For Our Future, another Washington D.C.-based liberal group, has spent $174,148 in Wisconsin so far. Most of that, $127,000, is going into the governor’s race. State senate races take up another $93,000 and $7,800 is going into the Attorney General’s race. Liberal cause bankroller Steyer’s Nextgen America has an action committee that, as of Sept. 25, has spent $167,266 on online ads supporting Evers. Steyer personally has donated $20,000 to Democrat attorney general candidate Josh Kaul. Steyer is providing $32 million to Nextgen’s efforts to mobilize the vote on college campuses across the country. Steyer and Nextgen America, however, are mostly focused on “Get-Out-The-Vote” efforts. Steyer is providing $32 million to Nextgen’s efforts to mobilize the vote on college campuses across the country. Nextgen’s operation in Wisconsin is getting $2.5 million of that, which is funding 60 paid staff and 300 volunteers on 26 campuses throughout the state. Steyer originally announced he would spend $2.3 million in Wisconsin. In July, MacIver News reported that Nextgen was active on just 14 campuses and planned to hire 53 staff in Wisconsin. The group says that millennials are the biggest potential voting bloc in the country, and they’re overwhelmingly liberal. The problem is they don’t always get out to vote. And so Nextgen’s strategy is: register young voters, get them to promise to vote, and then remind them to vote. In Wisconsin, as of Sept. 30, Nextgen has knocked on 49,000 doors, gotten secured 42,000 pledges from students to pledge to vote, and registered 6,000 new voters. Over the past month Nextgen has lured students to its voter registration booths by handing out popsicles, walking around with friendly dogs, and offering fun activities like inflatable carnival games. It is important to note that not all of the 42,000 pledges to vote are from eligible voters. An Urban Milwaukee report featured a 15-year-old signing the pledge. Liberal groups believe, overall, they’re having major success in mobilizing the youth vote. They point to a July 19 study by “TargetSmart” that found “share of youth registrants nationwide has increased by 2.16 percent” between February and July – supposedly as a response to the Parkland school shooting in Florida on Feb. 14th. The study found the increase was 5.64 percent in Wisconsin. 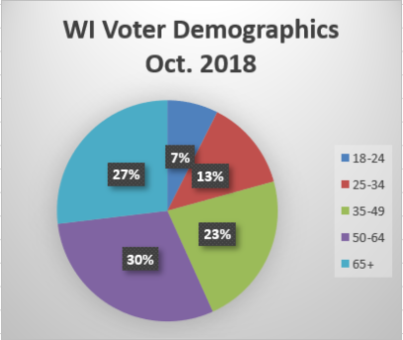 That study defined “youth” as 18-29, an age bracket not used by Wisconsin’s Elections Commission. However, according to state documents, the breakdown of Wisconsin’s registered voters by age groups remained virtually unchanged from February through July right up to Oct. 1. The number of voters aged 18-24 has increased by 20,585 from February to October. That makes up 16 percent of total new registrations. For ages 25-34, it’s increased by 34,223, or 26 percent of new registrations. The fastest growing demographic is 65+ with 36,531 new registrations or 28 percent of the total. Liberals believe African American voters are another group that can help them win in November. A new group that has popped up in Wisconsin is called BLOC, or Black Leaders Organizing for Communities. The organization has a budget of $600,000, which supports five staff and 24 paid canvassers. BLOC has knocked on 61,000 doors as of Sept. 21, and hope to reach 100,000 by election day. In terms of geography, liberals say they can’t win in November without a big turnout in Milwaukee and Madison, with huge progressive populations. Naturally, that’s where they’re focusing their efforts – particularly with voter registration and early voting. 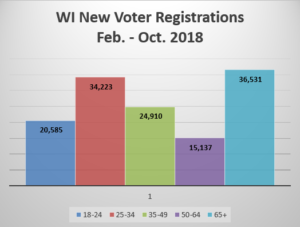 Over the past two months, 10,000 new voters have registered in Milwaukee County and 8,100 new voters in Dane County. The two counties are also leading the way in absentee ballots. As of Oct. 4, the state has sent 17,711 absentee ballots to Milwaukee County and 10,633 ballots to Dane County. Almost 9,500 have been completed and returned. However, due to voter roll maintenance, Milwaukee and Dane counties have 134,909 fewer registered voters than they did in October 2016. The state as a whole is down 341,392. Amid these demographic challenges, the city of Milwaukee has made changes to early voting this year hoping to increase access. The city has eight early voting locations this year, up from three during the presidential election. Two of the new sites are at Milwaukee Area Technical College and the University of Wisconsin-Milwaukee. 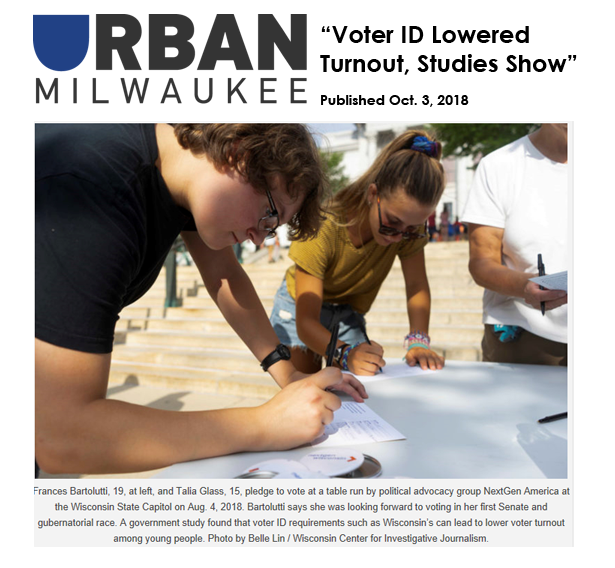 The Milwaukee Common Council also passed a resolution in September calling on the state to pre-register 16- and 17-year-olds, allow voters to use their smart phones instead of an ID card, and automatically register everyone qualified to vote in Wisconsin. All of these issues converged at Barack Obama School of Career and Technical Education (an MPS high school) on Oct. 4. Milwaukee County Supervisor Sequanna Taylor, MPS Superintendent Keith Posley, Democrat Candidate for the 16th Assembly District Kalan Haywood, and Shauntay Nelson from Wisconsin Voices (a liberal networking organization) held an event at the high school encouraging the teenagers to register to vote. “This year, young people will make up the largest group of eligible voters for the first time in any election. Your voice matters! You have the power to decide who will represent you locally and nationally. With voter registration materials now available right here in your school, it is easier than ever to make sure your voice is heard and your vote counts,” said Taylor. All this has left Republicans scrambling. Despite outraising and outspending Democrats, the latest Marquette University Law School poll shows Walker trailing Evers by 5 percentage points. A new poll is scheduled for release later this week.